Frederick James Burbage was born in 1893 in Yeovil, one of the 11 children of engine fitter James Burbage (1866-1935) and his wife Elizabeth Jane née Hunt (1865-1940). The family lived at 6 Addlewell Lane and in the 1901 census eight-year-old Frederick was listed there with his parents and five siblings. The family were still listed there in 1911 but by this time 18-year-old Frederick was working as an errand boy in Aplin & Barrett's cheese factory in Newton Road. 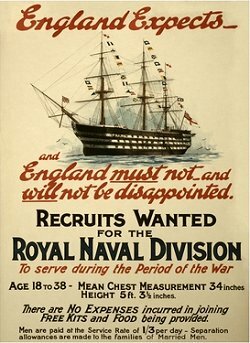 At the outbreak of war Frederick enlisted in the Royal Navy (Service Number SS/5481). As an Ordinary Seaman he served aboard HMS Essex. HMS Essex was one of ten Monmouth-class armoured cruisers built for the Royal Navy in the first decade of the 20th century. Upon completion she was assigned to the 2nd Cruiser Squadron of the Channel Fleet. She was placed in reserve in March 1906 and re-commissioned in 1909 for service with the 4th Cruiser Squadron on the North America and West Indies Station. In 1912 she returned home and was assigned to the Training Squadron of Home Fleet. After a refit the following year, she rejoined the 4th Cruiser Squadron in early 1914. After the beginning of World War I in August, she captured a German merchantman that same month. She remained in the Atlantic for the entire war, escorting convoys and searching for German commerce raiders. 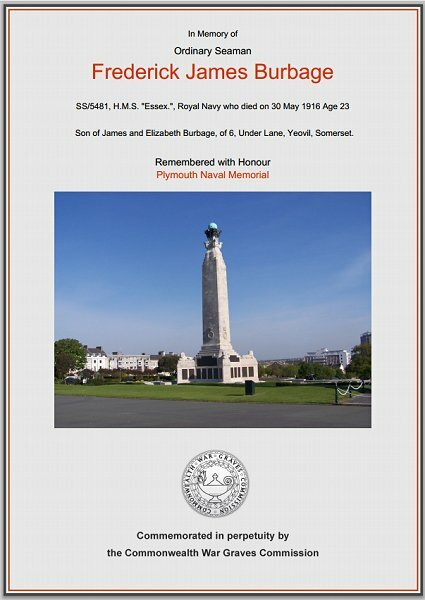 On 30 May 1916, Frederick Burbage accidentally drowned while serving on HMS Essex. He was aged 23 and was buried at sea. On 9 June 1916 the Western Gazette reported "The parents of Frederick James Burbage, who reside at 6 Addlewell Lane, received on Friday last, a notification stating that he was drowned whilst in action during the naval battle. Before joining the Navy he worked at Messrs. Aplin & Barrett’s. Deceased, who was 23 years of age had been in the Navy for about two years." However, many thanks to family member Sara White for the following - "Actually, he died on active service with the Royal Navy on the date of the Battle of Jutland, but not at the Battle of Jutland. It must have been a journalist who made the incorrect assumption without checking with the family. Frederick was serving on HMS Essex which was patrolling the Atlantic and at that date was moored off the Canary Islands. He drowned accidentally and was buried at sea." His younger brother Harry, a Private in the 1st/5th Battalion, Somerset Light Infantry, was to die in Egypt in 1918. Frederick Burbage's name is recorded on Panel 12 of the Plymouth Naval Memorial and on the Yeovil War Memorial in the Borough. The Commonwealth War Graves Commission certificate in memory of Frederick Burbage.